Motivating employees can not be done by raising their salary. This isn’t really a new perception, but still money is the biggest issue when talking about the compensation package for a new or existing job. As the Infographic below shows, rewarding and recognition of employees has a significant impact on motivation. “Free” recognition and virtual rewards have become increasingly important in today’s workforce over tangible, high cost rewards. More than that, a strategic approach for rewarding and recognition drives business results. Therefore some companies have already started with programs to support and increase the motivation of their employees. Motivated employees are more engaged and this is one of the key drivers for growth. Some continuous improvement strategies like TPS, LEAN and Six Sigma have “built in” recognition strategies to motivate team members and accelerate cultural change to adapt their company to future challenges. The most important thing by integrating such supporting strategies is providing instant and personal (positive) feedback to the employees. Recognize and reward your employees and you will see a lot of positive effects on the bottom line. Relentlessly eradicating waste is one of the paradigms of LEAN. Although this is well known, many improvement initiatives in the office area result in better equipment, more and better data bases and sometimes also in more people. The improvements will take place only on the processes that already work (well). That means you are working on a 10% slice of the whole cake. There you will never get a breakthrough in efficiency what you were looking for all the time. Instead of dealing with the 10%, focus your improvements on the other slide of the cake. This slice is really big. It’s 90% of what you are doing and unfortunately it is waste! We all know endless meetings with too many people, unclear instructions (operating procedures), mismatching interfaces between departments, fire fighting actions and so on. 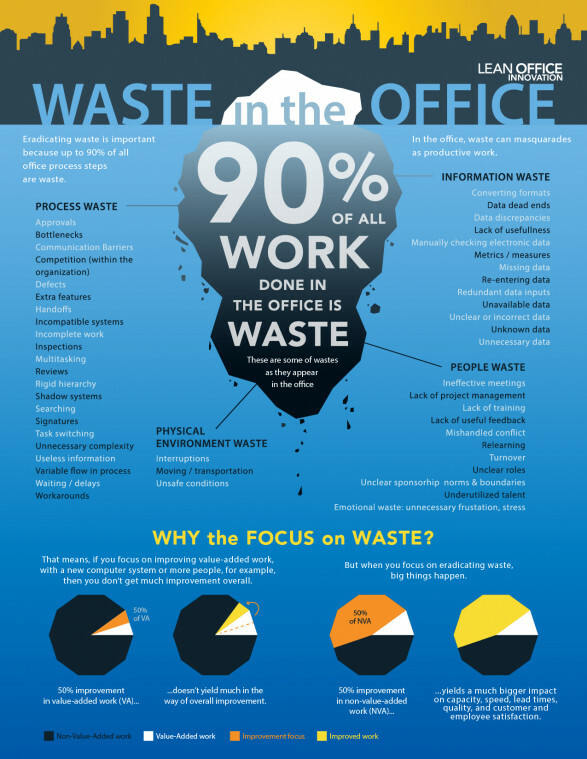 As well as in production environment, the 8 Wastes can be identified in the office area. TIM WOODS is our colleague who hinders us to be efficient. When you are launching a new product or preparing a quotation for a customer request, “Cost of Quality” is often an underrated part in your calculation. In particular the calculation of “Cost of Quality” is a very complex matter when you start to develop a completely new product with (at the beginning of the project) some uncertainties regarding components and production technologies. The best way to start with “Cost of Quality” for new developed product is to conduct a risk analysis about all the issues that may happen during manufacturing and later in the field after you have sold the product to the customer. As a result of this risk analysis you should have an estimation of how many products (or components) have to be scraped or repaired during manufacturing and how many products will return from the field for repair or replacement. Beside the value of the product itself , the costs for the processes will highly depend on the defect rate (defect parts per million) you expect over the life time of the product. This defect rate is determined by the capability of your design- and manufacturing processes and therefore often measured in sigma levels (or Cpk in production). The picture below shows the relationship between Sigma Levels and loss of money relative to the expected or current revenue. Assuming the result of your risk analysis shows a Sigma Level of 4 (or 6.200 defective ppm) you should be prepared to invest about 20% of your planned or current revenue in quality activities. These “Cost of Quality” should also be considered in your quotation process or, much better, strive for a much better Sigma Level. Today, again, you worked hard and you have accomplished a lot of things. You had to react on many customer calls and you have fixed a lot of problems these customers have with your products. But, at least, your boss honored you for your perfect fire-fighting attitude and results. It could have been a good day, but actually it wasn’t. All you did today was running painful against the Sigma Sonic wall. This wall is invisible, you cannot touch it. But, this wall prevents you from doing things right the first time and fulfilling your customer needs. The more energy you invest and the harder you work, the pain from running against this wall will even increase. The good thing is, although you can’t see or touch the Sigma Sonic Wall, you can measure it. This can be done by simply measuring the performance of your processes. For an average company the performance of their processes is between 3 and 4 Sigma, corresponding to a failure rate between 67.000 and 6.200 ppm (parts/services per million). Ship & Fix mentality => the field is the test ground! For breaking through this Sigma Sonic Wall you need appropriate methods and tools, almost like a brick layer who needs a drill machine for breaking through a massive stone wall. And of course, you have to understand the Voice of the Customer (VOC) much better. In the business world these methods are Lean, Six Sigma, Total Quality Management (TQM) and many others which do also provide a huge tool set to push this Sigma Sonic Wall step by step to higher Sigma values. Applying these methods and tools will also initiate a cultural transformation of your company. A well-defined strategy should support this transformation. What you have to consider for a cultural transformation can be read here. What else do you need to make the breakthrough happen?